I'm older than a lot of my Disney friends, but there's something fabulous that comes with age...acceptance, pride, confidence. 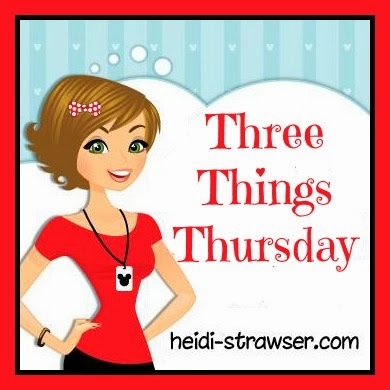 Today's Three Things Thursday is my chance to share some things I have learned at the ripe old age of 50 that I wish I had know when I was younger. Love Yourself. I promise it's the first step in having true friends and finding that someone special. If you don't love yourself you aren't ready for someone to love you. Love your extra 10 pounds, you potty mouth or your "prominent" nose. Self acceptance is a wonderful thing, and believe me you're a pretty awesome person. Always Be Yourself. Be yourself and never try to change to make someone else happy. You know yourself better than anyone, you know how you feel and what you like or don't like. If you ever have a relationship (romantic or otherwise) and the other person is constantly trying to change you - get out ASAP!! You want someone to love you for you, you shouldn't have to change who you are for anyone - ANYONE. You are perfect just the way you are, if someone doesn't like it that's their problem - show them to the door. Nothing drains you like negativity, refuse to let others rain on your parade. Be The Kind Of Friend You Want To Have. Everyone is not going to like you, that is a fact of life - but if you want to find true friends you have to be one. Genuinely support you friends in the best way you know how, and don't expect anything in return. You will be amazed at how good it makes you feel to do something nice for someone, that feeling is your reward. I fully believe that the Golden Rule we learned in elementary school is the best foundation for all of life's relationships. When you start follow the "Do unto others as you would have them do unto you." rule you will be amazed at how much fuller and happier your life will be. OK, I am stepping down from my soapbox with my awesome short haired, fully made up, cheap costume jewelry wearing, unapologetic self in tact and ready to be your BFF and support you in every way I can. Thanks for linking up this week! What a fabulous post and a great reminder to everyone - no matter the age! I know I tend to try to be a people pleaser, and that's not always a good thing either. Me too Heidi! There's a fine line between being nice and being taken advantage of. ❤️ This is awesome and I couldn't agree more!! I love your advice and I love you. Thanks for your friendship!! You know I love you Beth!! I don't know what I would do without my Disney Sisters! !